Modojo’s latest feature goes over six unannounced games they want to see on the Nintendo 3DS. Of course there’s some Zelda (Majora’s Mask 3D to be precise), but also WarioWare, Pokemon, Metroid, Kirby and F-Zero. I can’t disagree, I’d love to see all of them on the 3DS. Read on for what they had to say, and to let us know what you want to see on the Nintendo 3DS. More Zelda, please, and a side of WarioWare for the kids. With glasses free 3D, a gyroscope and StreetPass, the 3DS is the perfect candidate for a new entry in the beloved WarioWare franchise. Nintendo experimented with giving users the freedom to create their own micro games in last year’s D.I.Y., and we can’t wait to see where the company takes the series next. Nintendo has taken great care enhancing Ocarina of Time for 3DS, so giving Majora’s Mask a much-needed facelift makes sense. 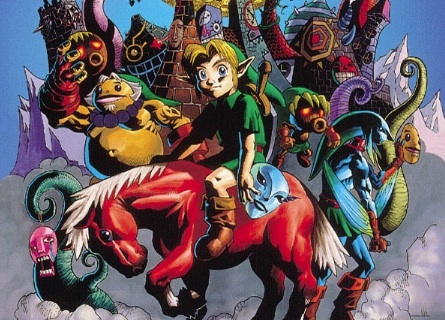 Not only would it give the system’s portfolio a boost, but thousands of younger gamers would also be able to experience this classic for the first time, putting masks on Link to transform the hero into different beings. With 3DS on the market, it’s only a matter of time before there’s a Pokemon adventure, and E3’s the perfect time to reveal the newest chapter. Special attacks would look incredible on the system’s screen, while StreetPass opens the door for innovative ways to wirelessly communicate with other players. Barring some Project Cafe announcement, the Metroid franchise appears to be in limbo, or is it? We endured the so-so Metroid Prime Pinball and Metroid Prime Hunters on DS. That aside, Nintendo should give us a more traditional adventure starring bounty hunter Samus Aran, complete with gorgeous 2D or even 3D graphics. Everyone’s favorite puffball made a grand entrance on DS in Kirby: Canvas Curse, which gave players a new way to control Nintendo’s hungriest character. It would be great for Kirby to make a similar splash on 3DS, sending everyone on another imaginative journey through Dream Land. We’ve given up hope for a new F-Zero on the Wii. Instead, we’d much rather see a sequel on 3DS. Nintendo’s futuristic racing series made two pit stops on the Game Boy Advance and received critical acclaim. We can only imagine what a newer title would be like in 3D. The only thing I don’t like about this, is that their “more Zelda” constitutes a 3D Majora’s Mask remake. Although I’d love that, what about a new title made especially for 3D?